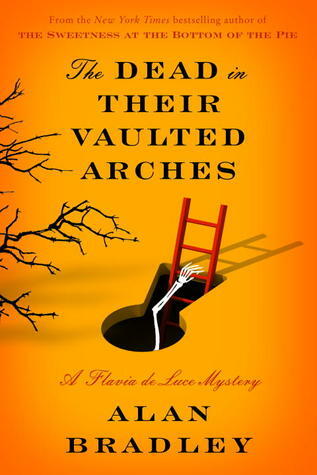 The Dead in Their Vaulted Arches takes the Flavia de Luce series in a completely different direction, and while the writing is still great and the mystery enjoyable, I’m not quite sure how I feel about this shift in the series. The book begins with the return of Flavia’s long-lost mother Harriet, and what that means for the de Luce family. Waiting on the platform for her mother’s train, Flavia receives a hurried, whispered message from a mysterious man, who shortly after gets killed on the train tracks. Winston Churchill makes a cameo, there is a mysterious reference to pheasants, and Flavia returns to Buckshaw with her family. All of this happens in the first chapter of the grandest Flavia de Luce adventure yet. Previous Flavia mysteries have had a cozy feel, Nancy Drew meets Miss Marple in a small village setting. There have always been hints in the background at a larger mystery involving the de Luce family (much of which I admit I chalked up to Flavia’s rich imagination) and Vaulted Arches finally tackles this mystery head on. Bradley takes Flavia de Luce into Maisie Dobbs territory. There is espionage, matters of national importance, secret codes, and Flavia is caught up right in the thick of it. We still get the classic Flavia elements — bickering older sisters, Dogger, Buckshaw — but the stakes are higher than ever before. Vaulted Arches also introduces a more mature Flavia. Much more thoughtful than in previous instalments, Flavia appears very conscious of being twelve and on the verge of growing up. She still has her delightfully childish moments, most often when dealing with unlikeable cousin and new character Undine, but overall, this is Flavia growing up, and kudos to Bradley for keeping it real and allowing us to see the character develop. We also get to see a classic Flavia de Luce science experiment, Flavia’s darkest and most disturbing attempt in the whole series, yet also the most fraught with emotional heft. Also a nice counterpoint to Flavia’s growing up, the experiment reveals an almost desperate need to cling to childlike belief, because the potential payoff is so very high. It’s difficult to keep such a long running series fresh, particularly when there is such a significant thread of a backstory tying everything together and preventing the series from being purely episodic. So in a way, I’m glad Bradley took the series in this direction — it’s a natural progression for Flavia as a sleuth and a way to take the mysteries to another level. Future Flavia mysteries will likely continue on in this vein, and the very next one (minor spoiler alert) will be set away from Buckshaw, a clear signal that this is a whole new type of Flavia de Luce mystery. Personally though, I’ll miss the cozy, small scale feel of the first few mysteries. I’ll certainly keep following the Flavia mysteries, and am excited to see how Bradley takes this series forward, yet I’ll always have a special place on my shelf for the beginning of the series, and the irrepressible turn of the century Nancy Drew racing around the dark passages of her family estate. This entry was posted in Book Reviews and tagged 50BookPledge2014, Fiction, Flavia de Luce, Mystery, Random House by Jaclyn. Bookmark the permalink.